Mindcore introduces to the Russian and CIS market the new service Online Dynamics Support (development Jakobsen Consulting, UK) – online support to users across the Microsoft Dynamics line of products with per-minute billing. In addition to the “classical” channels of support, customers can receive immediate professional assistance of experts at any time of day, including weekends and holidays. The reaction to the problems and questions from the clients that need to be addressed is instantaneous, no need to wait. The service works on the Pay As You Go (PAYG) principle – payment depends on the level of competences of the consultant and the time spent on addressing the problem. 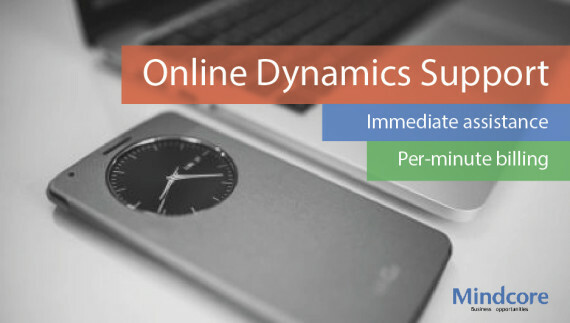 Mindcore consultants and other consultants working with Online Dynamics Support are professionals with 3 to 15 or more years of experience in Dynamics solutions, certified by Microsoft and tested by Online Dynamics company. All the skills that they possess are reflected in the profile of consultants, so customers can choose a specialist needed for a particular purpose. When the client needs to solve some small problems, there is no point to attract experienced and “expensive” experts – the service can be much cheaper. If you are having some non-trivial problems it is possible to find an experienced consultant with expertise in the particular field in which you have a problem. Despite the higher rate, highly skilled consultants will do the job much faster. There is no need to pay for an hour when the time spent on solving the issue was 20 minutes – you pay only for the exact time the consultant spent with you on your problem. The system records all the calls and keeps statistics, so customers can control the flow of their money and understand how quickly their problem was solved. Alexander Baikov, Director of Partnerships at Mindcore company comments: “This new support feature that we’re happy to introduce to the Russian market is dictated not only by desire to be a modern company. With this solution everyone’s a winer: customers understand how much they pay for services and what they pay for, they can even choose the consultant to work with. No need to arrange consultations: as soon as there is a question, there is always a consultant on Online Dynamics Support platform to contact and get a quick response from. As a result, customer saves time and money, consultants and partners receive additional work”. To communicate with a customer consultant uses voice calls, chat and the “screen-sharing” feature.